FreshNeck is a subscription-based, men’s accessories exchange service. 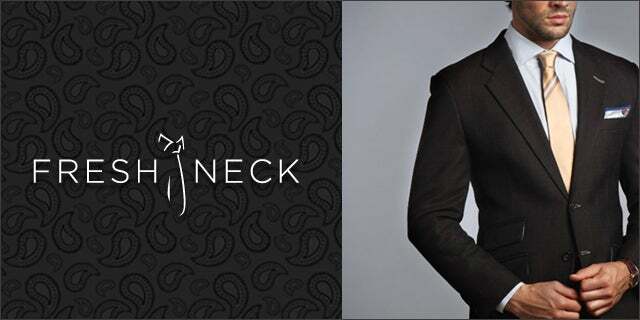 Members can access FreshNeck’s vibrant and versatile stock of neckties, bow ties, pocket squares, and cufflinks based on their tiered subscription, through FreshNeck’s visually crisp website. Membership starts at $15 per month, and designers like Hermes, Brioni, and Versace are just some of the options at the top-tier membership. CEO David Goldberg, who cofounded FreshNeck with his brother Bryan, believes they address the need for a variety of professional and formal wear accessories for men, without breaking the bank and overflowing closets and drawers. Like Netflix, members can use their accessories as long as they want before exchanging them for “fresh” items. Tech Cocktail asked David Goldberg about his plans for FreshNeck and his experience as a startup entrepreneur. Tech Cocktail: What personality trait has served you best as an entrepreneur? David Goldberg: My ability to shake things off, both the good and the bad. There is always a new challenge to conquer, so you cannot waste time or effort thinking about the past. Tech Cocktail: What is the hardest lesson you’ve learned thus far with FreshNeck? Goldberg: Everything takes longer than you plan for. Building the website, acquiring customers, raising money. It’s a grind, but one that is worth the journey. Tech Cocktail: What is your long-term vision for FreshNeck and the men’s accessory industry? Goldberg: For collaborative consumption to take over the men’s accessories space. Like how Netflix made Blockbuster irrelevant. And for men to actually wear ties! Tech Cocktail: What trend are you excited about, not as an entrepreneur but as a consumer? Goldberg: I’m a huge geek for collaborative consumption.Both the economics behind it, as well as the value to customers. I truly believe its the way of the future and will take big bites out of multiple industries. Tech Cocktail: New startup founders are always seeking and giving advice. What is one common piece startup advice that you completely disagree with? Goldberg: “Ideas are worthless.” I understand that the team and execution are critical, but you need to be starting with a good idea as well, solving a true pain point. Tech Cocktail: If FreshNeck were a cocktail, which one would it be? Goldberg: Single Malt Scotch. Both FreshNeck and Scotch can be enjoyed by a gentleman. Tech Cocktail: What is one quirky fact about FreshNeck? Goldberg: Though I run a neckwear company, I do not know how to tie my own bow tie. My fiancée does it for me! FreshNeck was a showcased startup at our Tech Cocktail New York mixer. LG has revealed two flagship phones at MWC 2019: their 5G-capable V50 ThinQ phone and their new G8 ThinQ. The coolest new features include long-awaited 5G support and LG's weird new spin on the foldable phone craze.